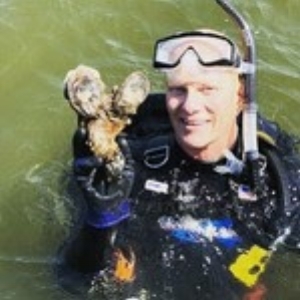 Jeff Horstman dives on the Miles River MGO oyster sanctuary in May 2018. ShoreRivers dived on the Miles River Marylander’s Grow Oyster (MGO) sanctuary reef in May to check progress and success of past plantings. ShoreRivers has been planting Miles River growers' oysters on this reef since 2010, and this was our first experience checking in on them. ShoreRivers Executive Director Jeff Horstman found mature oysters with new spat set on the reef--a very encouraging sign! Special shout out to Aqua Adventures Divers for all of their help in this endeavor. CLICK HERE to see view video.